Note: This book releases on October 13. Tor provided a complementary ARC copy. Servant of a Dark God by John Brown is one of those novels that I pick up with some reluctance, not really thinking it's for me, but then I end up enjoying it thoroughly. Mr. Brown has taken a very different approach with Servant of a Dark God. This is an epic fantasy that does not involve epic journeys, recent calamities or long-term character arcs. It does involve long-term lies; the kind of lies that are told over such a long period of time that they are thought of as truths. Servant of a Dark God begins in the point-of-view of Talen, a boy. He's probably younger than fifteen, but not by much. He has an older brother named Ke and an older sister named River. His father's name is Hogan. He has an Uncle Argoth, with a son named Nettle. In a nearby town, a family has been accused of slethery. Slethery is the illegal use of fire, which is one of the elements of life. All creatures have soul and fire. Fire may be thought of as the days of your life. Slethery is the use of fire that has been taken from another person, hence it's illegality. The accused family consists of Sparrow, a blacksmith, his wife Purity, their daughter Sugar and their blind son, Legs. Definitely not your run-of-the-mill fantasy names. They're all easy to pronounce, and there's not an apostrophe in the bunch. The story begins in Talon's point-of-view, and his is the most prevalent viewpoint. Other viewpoint characters are Sugar and Argoth. And then we have Hunger, another viewpoint character. Hunger is a sort of a golom. He has been created out of rock, wood, dirt and plants. He even has flowers growing out of his shoulder, which makes him rather whimsical, even though he is often horrible. He's one of those villains who engages your sympathy. So half the time you are rooting him on, and the other half, you are saying, "Oh no! If he wins, then my favorite character is going to die!" UPDATE: Just wanted to expand on Hunger. He is not the villain--you actually feel sorry for the poor creature. But he's no more a villain than Quasimodo was in The Hunchback of Notre Dame, or Lennie was in Of Mice and Men. The actual villain is much more chilling than Hunger. The story is about the unraveling of old lies. It's also about families. Like Russell Kirkpatrick's Across the Face of the World, the families in this novel, for the most part, remain together. I enjoyed this very much, and it was one of the reasons I liked Kirkpatrick's novel as well. When the group is all family, it makes the lengths the characters will go through on each other's behalf all the greater. One of the problems I had early on was Talon as the point-of-view character. He's a bit of a brat. He's all too willing to turn Sugar and Legs over to the authorities, even when he knows that they won't get fair treatment. He's part of an oppressed minority, and he's a bit hung up on that. I know this was necessary for his character development, but it did prevent my bonding with him at first. The opening chapter, especially, made him seem foolish and bratty. I was just wishing he would save a puppy or something. Anything to inspire some liking for him. Fortunately, Sugar's point-of-view wasn't very far in, and she was able to carry me through until Talon grew up a bit. The worldbuilding is incredible. John Brown doles out his backstory more-or-less evenly, but toward the end, the backstory got a bit heavy. This may have been because Mr. Brown ratcheted up the tension so high that I got impatient when backstory came up. But I had to pay attention, because there were secrets revealed, while leaving other secrets for the next novel. I was afraid there would be a cliffhanger, but there wasn't. 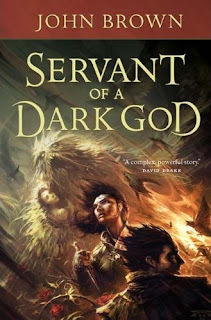 Servant of a Dark God is an unexpected novel, much like The Warded Man was, in that I expected one thing and got something very different. There was a satisfying--if sad--ending that looked toward book 2, leaving just enough unanswered questions to make me look forward to the next book. On Thursday, I will post an interview with John Brown. It is one of the most enjoyable interviews I've had with an author in quite some time. Looking forward to this after reading your review! I agree; family stories are refreshing. Kelly, I'll put up a Debut Showcase next week on the release date to remind you about it. Hunger is not THE villain, and he is thoroughly engaging. Please don't let that put you off! You actually feel sorry for the poor creature. He's no more a villain than Quasimodo was in The Hunchback of Notre Dame, or Lenny was in Of Mice and Men. In fact, I'm going to update my post. This was a good book, no doubt. I just posted my interview with the author at http://theintelli-gent.blogspot.com and should have a review up soon. I really enjoyed the family aspect of this book, too. Man, the scene with the father and son...wow, tugged the heart strings near to breaking.